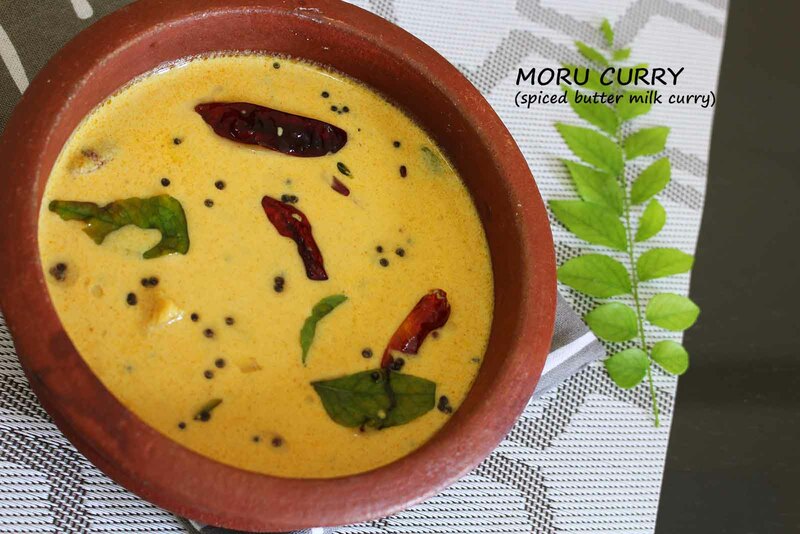 Kerala cuisine or Kerala sadya is incomplete without a moru curry / spiced buttermilk curry. ' Moru 'which means butter milk in english is used in kerala cuisine in different ways. Here am with a special Chena moru curry which is a very common vegetarian dish in Kerala. You can also try this curry using ripe plantain, ash gourd, bottle gourd etc. Each of this vegetable adds different flavor to the curry and you can choose your favorite veggie too. I often love make instant moru curry for my lunch which can be prepared in just 5 minutes. No onion no veggies but tastes excellent. It tastes outstanding with steamed rice and is very quick too. But my hubby dislikes such curry without any veggies. Moreover he likes yam / chena which has got many health benefits. So why can't i go for chena moru curry? 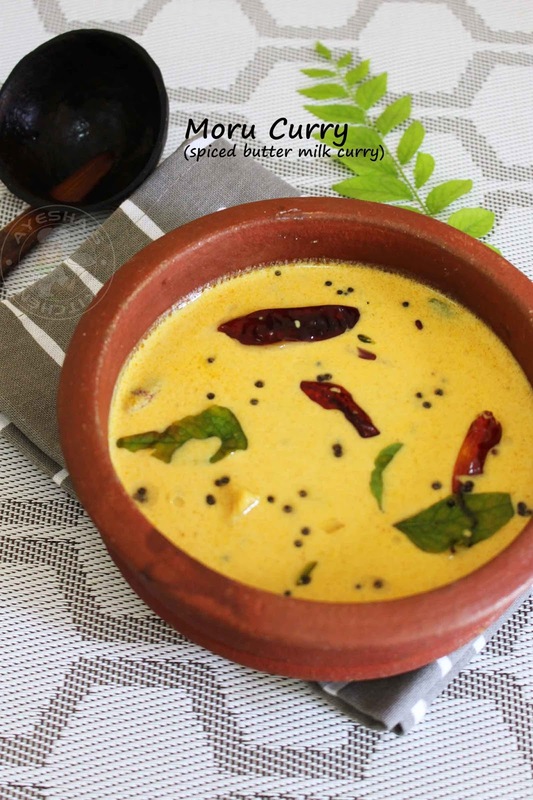 This chena moru curry / spiced butter milk curry with ground coconut paste and yam is yet another special moru curry which i suggest serving with some steamed motta rice. This super healthy curry makes a tasty vegetarian lunch with rice and stir fried veggies. Adding veggies to buttermilk curry is very common among keralites. This is a mildly spiced curry with yam, yogurt (or curd), coconut paste and some spices. In kerala state, this curry is also known as pulissery, puli curry, nadan moru curry, chena puli curry, like so. 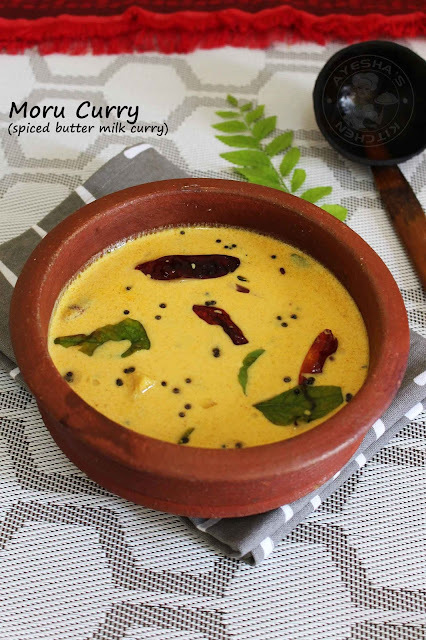 So lets move on to the recipe showing how to make simple special moru curry/ chena moru curry / spiced buttermilk curry / onam sadya recipes / kerala vibhavangal / vishu recipes. Grind together all the ingredients given under ' to grind ' until smooth. Set aside. ( Do not add water while grinding ). Cut the yam / chena into 1 inch square pieces. In a saucepan, add the yam / chena pieces along with turmeric powder, salt and half a cup of water. Cook until the yam / chena is done. Set it aside. Now heat a wok with oil. Sputter mustard seeds and then add fenugreek seeds followed by dried red chilies, green chili or red chili, onion chopped and curry leaves. Saute until onion becomes transparent. When done, add chili powder (optional only, this gives a fine red color to the curry). Now add the cooked chena or yam. Mix well. Let it cook for 2 minutes. Then add the ground coconut curd mixture. Stir well. Check for salt. Continue to cook and remove from flame immediately when bubbles starts. Do not let it boil after adding curd mixture (very important). Combine well and keep covered until ready to serve. Serve this chena moru curry along with steamed rice. You can also use kumbalanga (ash gourd), cheranga (bottle gourd) instead of chena (yam).